Disney In Pictures - Resort Relaxation! Disney In Pictures – Resort Relaxation! When it comes to Walt Disney World, one of the things that all of us enjoy — without a doubt, I would imagine — is using our time at Disney to relax, to get away from the rat race for a while, to just slow down. So for me, today’s Disney In Pictures theme really hits the nail, and I hope it does for you too! So sit back, enjoy the view, and relax with us today, as we explore Resort Relaxation! I’ve got a lot of great feedback on this topic! Thanks to everyone that has sent me some photos of their favorite ways of relaxing! To start us off, I’m going to share with you some of my favorite shots, and these weren’t even taken by me! Over at Downtown Disney, they have the balloon ride Characters in Flight. If you’ve never done it, I highly recommend it (of course, I’ve never done it either, so I guess I should recommend it to myself!) Here is just one of the incredible shots that my wife Cindy got from this incredible view! Flying High over Downtown Disney, with Saratoga Springs Resort & Spa in view! One of my favorite things to do is to take photographs, so for me, relaxing at the resort almost always includes taking photos of the various activities you can do at the resort. Last June, when we stayed at Bay Lake Tower, we had a lake view, with a view of the pool from our room on the 11th floor! I really enjoyed the pool, especially the water slide! The Pool at Bay Lake Tower! The Incredible Water Slide! If you do it, make sure you get as flat as you can, you’ll really take off! 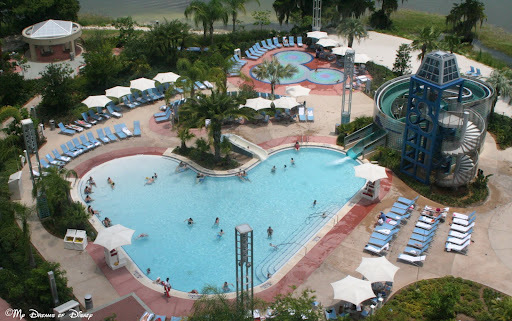 The Bay Lake Tower pool is a lot of fun, but another pool that we enjoyed was over at Coronado Springs Resort & Spa! The Mayan themed resort, with it’s great pool, had a lot of fun things, and I was able to get this relaxing nighttime shot of the pool when I went out walking one night. It’s the simple things that kids love the best! There’s nothing like a slide and dip in the resort pool after a long day in the parks! My boys have long been HUGE fans of Disney’s Fantasia Gardens Miniature Golf Course, and we often visit (usually in the evening, when it’s cooler) during stays at the Epcot Resort area. Each hole includes elements from one of their favorite movies, Fantasia; I hope that they never outgrow it!! I am a Night Owl on Disney vacations when I get the opportunity to stay on property. Because we are DVC members with our Home Base at Bay Lake Tower, I get the chance to roam all over the Contemporary Resort late at night, which is a real visual treat. The lighting is soft, the frogs are croaking, and the Bay Lake gently laps at the shoreline as the transportation boats go back and forth to Wilderness Lodge. Boat whistles sound like music to the ears. Believe it or not, people swim until nearly mid-night, and sometimes after. Unlike the craziness of the Magic Kingdom, which I truly love, the only real time I feel relaxed on vacation is late at night. The Contemporary is such an iconic Disney building, and just standing before it, I feel like I am 7-years-old again. It’s vacation déjà vu with a relaxing twist. And yet when the sun comes up, the lobby is a fantastic place to do some shopping or grab a bite to eat in the Contempo Café, while the monorails zip in and out. I have as many good memories of Disney Resorts as I do riding Disney rides, but I would always choose the Contemporary resort to walk around at night. If you like Disney photography, stop by to see me at Mouze Kateerz on Facebook and Mouze Kateerz on Pinterest. I’ve shared with you a lot of different ways to relax at your resort or, more specifically, away from the parks. To close out this week, I’d like to share with you just a few more ways that we relaxed away from the parks. Enjoy, and thanks for stopping by! I’ll talk to you later! The Bridge at the Boardwalk — a great place to relax! Why not take a stroll along the Sassagoula River? If you stay at Bay Lake Tower you can take all the photos you want of this landmark from the window of the 11th floor! How about taking in the band at the Grand Floridian Resort & Spa? Why not pose with your daughter and one of the band members for a picture? I hope you have enjoyed your virtual tour around the resorts! Look for next week’s theme on Wednesday! Disney in Pictures: Character Shots! Great post! All wonderful ways to relax!! Thanks for including my picture in your post! Thanks everyone! Great pictures by great writers and photographers, so thanks for contributing! Next Post: The Next Disney Dining Review!